UPPAbaby has built a reputation for making innovative, high quality baby products. The new 2013 G-Luxe is no different, with improved features that fit the needs of parents and babies alike, without sacrificing style. The UPPAbaby G-Luxe incorporates many details to make life easier for any parent. When you are out and about with your baby, you may often worry about nap time. The G-Luxe reclines to give your baby or toddler a perfect place to nap, wherever you are. The seat reclines and the footrest is adjustable to allow the child to have their feet up. Although the stroller does not completely lay flat, there are 3 different recline positions. The stroller can be easily folded and stored. By simply pressing a safety button in the handle, and lifting two finger triggers, the stroller folds down and locks into place. It stands by itself while being stored, only weights 11lbs, and has a carrying handle for easy carrying. This makes it a great option for traveling. The G-Luxe makes keeping a stroller clean easy. The seat pad is not only comfortable, but also can be removed easily. The seat pad is machine washable and is stain and water resistant, making it very unlikely you will have to worry about getting tough stains out of the stroller. Some other great features include an extendable SPF 50+ sunshade that will shade your child while you are our and about during the day, a storage basket below the seat, a cupholder, and high performance wheels. 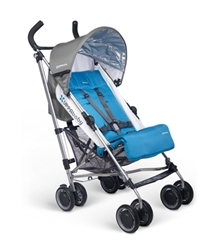 The UPPAbaby G-Luxe 2013 is a great solution for parents looking for a lightweight and convenient stroller. UPPAbaby has paid attention to the finest details to create a stroller that both mother and baby will appreciate. Dainty Baby carries the UPPAbaby G-Luxe 2013 as well as many other quality baby strollers and other baby products. Enjoy free shipping on every order.